Enter the names you'd like at the top of the print here! 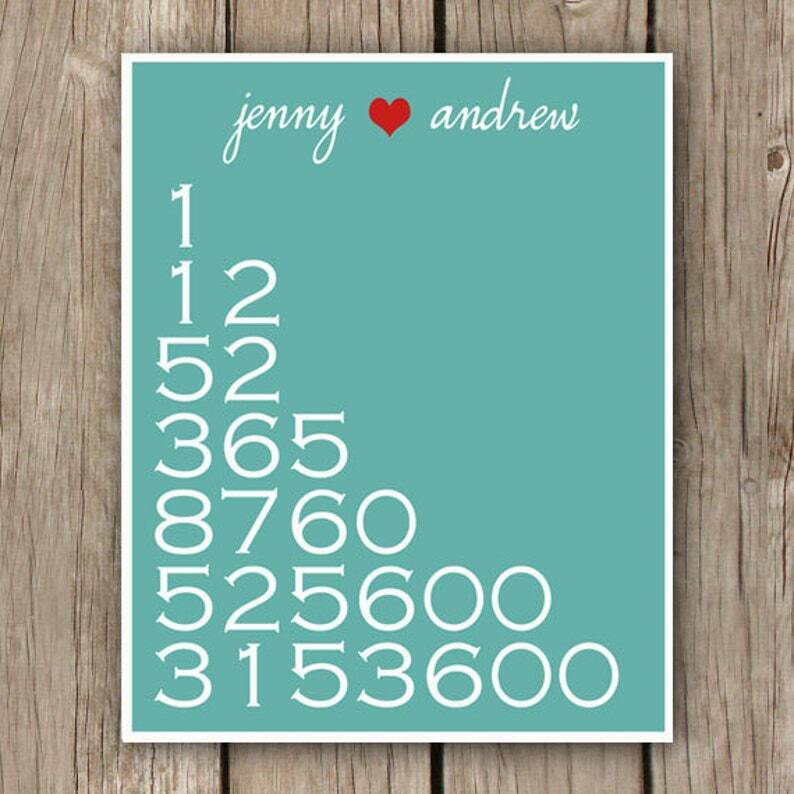 Add this Printable Anniversary By The Numbers print to your decor as a fun way to display tell your love! Great gift idea! Track your love by year, months, weeks, days, hours, minutes and seconds! Print size: 8" x 10". PLEASE INCLUDE THE COUPLES NAMES AND YEARS MARRIED IN THE "MESSAGE TO SELLER" SECTION AT CHECKOUT! Best printed on 110 lb. card stock. Hi-res PDF (300 DPI). Printed in color ink on 110 lb. card stock. Shipped to you in protective sleeve in a cardboard photo mailer. Shipping charges are included in price. Shipping to countries outside of the United States will incur additional shipping charges. Please contact me for rates. After your payment has cleared I will email you a digital proof within 24-36 hours. Once you have replied with your approval the digital file (.PDF) or print will be sent to you. Please make sure the email address or mailing address connected to your account is up to date. If you’d like the file sent to an alternate address, leave the address in the "Message to Seller" or “Notes” section at check out. Perfect, my MIL loves it! Just as pictured! Thank you! I accept payment through Etsy and Paypal. If you are unsatisfied for any reason, please contact me! Digital files will be delivered promptly to the email address you provide once final approval is received on the proof sent. Our goal is to send those to you the by the following day after the final approval is received. Card stock prints will be delivered via USPS Media Mail. Our goal is to ship those out the following business day after final approval of the proof is received. Shipping Upgrades to USPS Priority Mail or USPS Express Mail are available. Contact me prior to purchasing for shipping rates. For shipping to Canada, choose Standard Shipping for Digital Files. If ordering a card stock print, please choose the upgraded shipping charges for that item. Contact me with any questions prior to purchase. I am happy to ship to other international addresses, but additional shipping charges apply for addresses outside of the United States. Please contact me for international shipping rates. All designs are property of Got Paper Design. Digital files may not be shared with others. Digital files may not be re-sold. When ordering the digital prints, you may print these yourself on your home printer or take the files to a local print shop to be printed.